In the latest instalment of Things We Already Knew, yet another study has been released that argues Australian schools are not adequately preparing students for real life. The research, discusses the relatively high unemployment rate for young people in Australia and claims that it’s due to educational institutions placing too much emphasis on academic success rather than practical skills for employment. You know who else has been saying the same thing for a while? You guys. 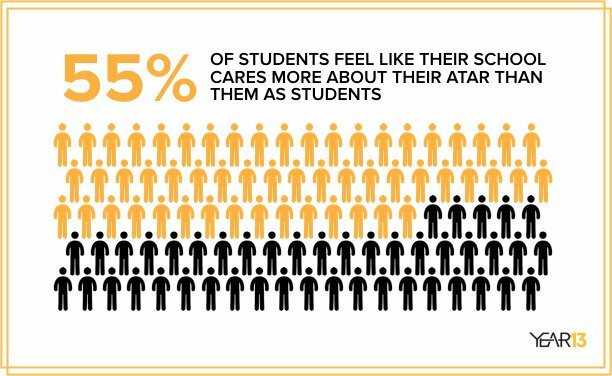 Last year we released our first After The ATAR report and found that 55% of youth believed schools cared more about their ATAR than them as students. This year we found much the same. The study by Mitchell Institute claims that given the lack of diverse and nationally regulated measurement standards for broader education goals, schools and education departments are driven to emphasise NAPLAN results and the ATAR. Furthermore, it argues that vocational education training (VET) and apprenticeship and traineeship programs are a valuable education pathway for young people, and criticises the lack of government and community investment in this resource. One potential solution suggested by the study is to reform the model for senior secondary education. It states that VET should have a greater presence in schools on a structural and cultural level, on par with or similar to academic learning. Also important is a shift in community perception to value vocational training, and for students to be given better and broader career guidance to fully understand the range of employment options available to them. Another suggested solution by the paper is expanding the apprenticeship model to other fields and industries in collaboration with industry leaders. For example, the UK is trialling degree apprenticeships in fields such as technology, banking, and engineering, in which a Bachelor’s or Master’s degree is combined with employment. Again, many of these ideas are just confirming what we’ve already known for a long time. Of course, we all know teachers and educators that do have our best interests at heart, including our readiness for the real world; the problem is that they can only do the best they can with the tools they have. Which is why we’ve made things like FinLit–a program which will teach you all the things you never learnt in school like taxes, budgeting and saving for travel. Schools have done a good job at improving and prioritising academic success, but that’s about to change. Let’s show them that we want more than that noweb that we want our education to prepare us for real life too.